Absolutely genius. Love the look of sheer delight on the foxes faces! Really lovely choice of colour palette Phil... I especially like the 3 colours of chicken and, as Kev says, the sheer exuberant delight of the foxes is a joy! beautiful colors and great fun!! 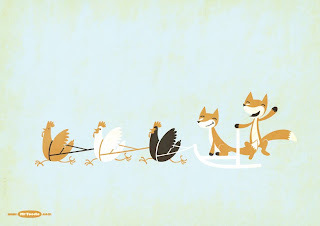 I like it that the fox does NOT eat the chickens! This is so adorable. I love the style and the characters are so cute! I like the stylized foxes, very nice! Ingenious how you changed the color of the harness depending on color of the chicken. So much fun - great limited palette. I really like your style! wonderful!